Dolly and event founder Sam Haskell. Photo courtesy Hartman Holliman. 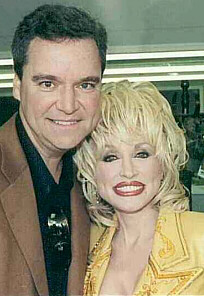 All photos on the following pages are ©2000 Duane Gordon/Dollymania. And please be patient, as these pages will each take a few minutes to download. For Dollymania's story on the events, click here. Click here for the official Stars Over Mississippi Web site. Please note, as a media professional, I must protect my copyrights. Use of the photographs without prior written consent is strictly prohibited. If you would like to re-post them on another website or print them in any publication, you must obtain my permission first. You may contact me at here.